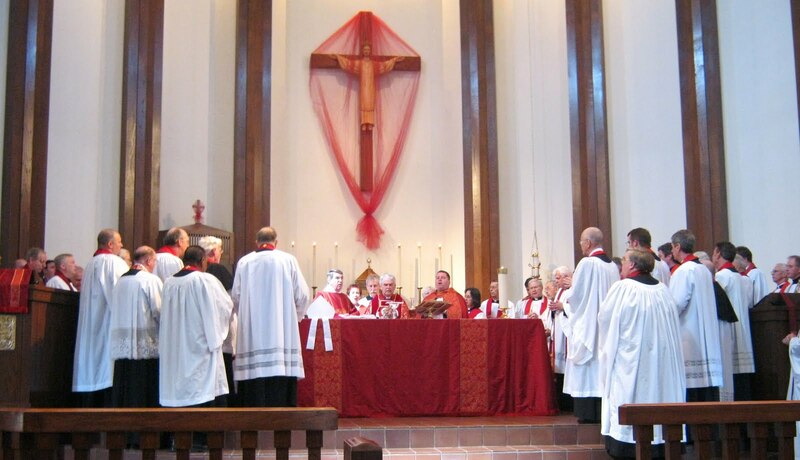 It fell to me to attempt to put the clergy of our diocese into order by the date of their canonical residency here in order for us to process into the Chrism mass/Mass of Collegiality today at St. Vincent's. Not an easy task. Herding priests is something like herding cats! Bishop Iker delivered a fine homily, in which he reassured us that despite all the uncertainties of the present day we have done the right thing by standing steadfastly for "the Faith once delivered to the saints." And the bishop also reminded us that God certainly has a plan to see that His will is done in all this, even if we cannot say exactly what that plan is at the moment. Many thanks to my father, R.D. Foster, for coming today and taking these fine photos of the event. St. Andrew's Church in Mt. 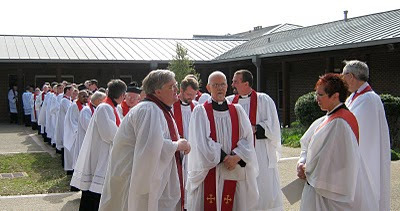 Pleasant, South Carolina, has voted by a 97% margin to depart from the Episcopal Church and align with the Anglican Church in North America. The report below is taken from blog of its rector, the Rev. Steve Wood. A full report may be found by clicking the title to this post. As you know, yesterday we gathered at 12.15 pm for a Special Meeting of the Parish to consider our way forward. First, let me say how deeply I appreciated the participation of the 722 people who cast ballots. This day and this decision was without a doubt one of the most significant days and decisions in the history of this parish. Thank you for your faithfulness and for your willingness to complete the process we began many months ago. I rejoice and give thanks for both the clarity of this discernment process and the unity of purpose within this parish demonstrated by this vote. Unity and discernment are both gifts worked in our lives by the Spirit. Having said that, I am reminded that at least 19 members of St. Andrew’s may not be rejoicing in this vote and I commend them to you and your prayers as brothers and sisters in Christ. 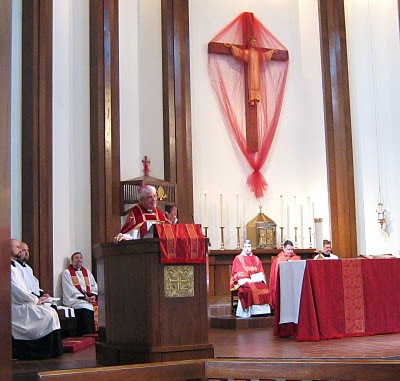 Please commit with me to ensure that St. Andrew’s will remain a parish where all are welcome to gather at the foot of the cross; sinners yet redeemed by the wonderful work of Christ. Passion Eucharist. It was a wonderful day. Monday, Tuesday, and Wednesday the Eucharist will be celebrated at 7PM. The Great Vigil of Easter will be celebrated at 8PM. I hope to see you there! 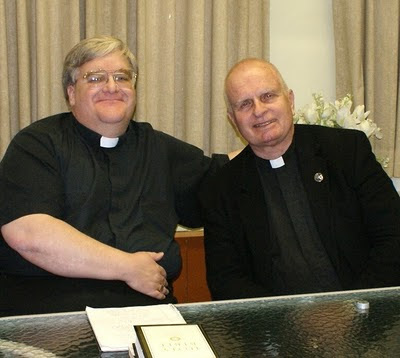 Last night I was warmly welcomed by Fr. Ken MacKenzie and the good people of All Saints' Church in Wichita Falls. I was joined for the journey by my father and an old family friend, who proved excellent company for the 120 mile road trip. We joined them for Eucharist and then I taught a class on "church growth in ancient Christianity" while the parishioners enjoyed a light Lenten meal. The MacKenzies, Deacon Crab, and the parishioners were very hospitable. And the questions and comments were great! Thanks, Fr. Ken, for the invitation! In Thanksgiving to the Cathedral Church of St. Vincent. 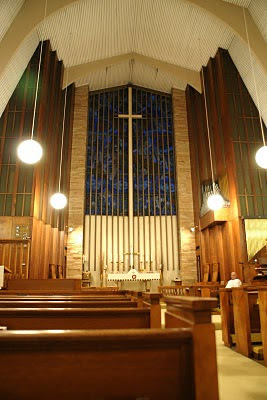 At this place on June 23, 2009 the Anglican Church in North America was officially constituted. 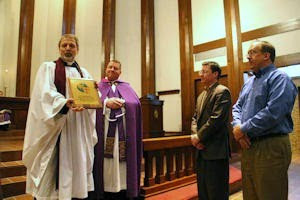 Those accepting the gift on behalf of the parish were: Dean Ryan Reed, Joe Graber, Bob Thornton, and Thom & Jan Murrell. The plaque will hang in the narthex of the cathedral.